NOTE: The Inland Seas Maritime Museum in Vermilion has permanently closed in preparation for its re-opening sometime in 2013 in Toledo. 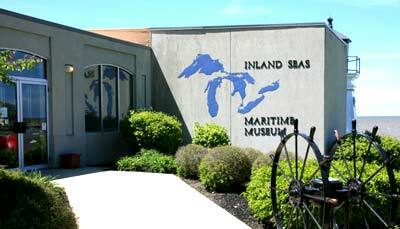 Located in the nautical town of Vermilion, the Inland Seas Maritime Museum is dedicated to preserving the nautical history of the Great Lakes. The museum was originally housed in the Cleveland Public Library, it soon outgrew those quarters. In 1953, Commodore Albert Wakefield donated his home overlooking Lake Erie to Bowling Green State University. BGSU then leased the building to the Great Lakes Historical Society as the permanent home for the museum. In 1968 the home was expanded with a new contemporary wing, while not exactly in keeping with the original homes structure, it does provide for more expansive exhibition space. In 1992, a replica of the iron 1877 Vermilion Lighthouse was erected on the Society's property, exactly where Commodore Wakefield had wanted to put it when the original 1877 lighthouse was dismantled. 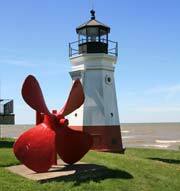 The replica lighthouse has become a landmark of Vermilion's rich nautical heritage. At the same time, the pilothouse from the Great Lakes carrier Canopus, was added to the lake side part of the building. The pilothouse allows visitors to step back in time and imagine yourself on board the CANOPUS. Standing behind the massive wooden steering wheel, no land is visible. The pilothouse contains its period instruments, navigation equipment, and even a whistle pull as you lookout over the breaking waves of Lake Erie. Lighthouses and lifesaving services are an important part of the museum. See up close actual lenses from several lighthouses from around the Great Lakes as well as equipment used over the years by the U.S. Coast Guard. The museum is loaded with everything associated with Great Lakes shipping, but several items are of particular interest. In one section of the museum are actual artifacts recovered from the Edmund Fitzgerald, which was perhaps one of the best known shipwrecks in recent years. Included in this exhibit is the sounding board and a life preserver from the Edmund Fitzgerald that washed ashore after the wreck. The display also gives several theories of why the ship sank as well as scale models of the ship. The EDMUND FITZGERALD is perhaps the Great Lakes' best-known shipwreck. On November 10, 1975, the Fitzgerald sunk in Lake Superior with all 29 hands lost. The sinking had no witnesses, and the exact cause continues to be a topic of debate today. During the War of 1812, a major victory over a British naval force occurred on Lake Erie. This battle became known as the Battle of Lake Erie and was led by Commodore Perry. During the battle a number of ships were lost or damaged. One of the artifacts located in the museum is a wooden rudder recovered near West Sister Island in the western part of Lake Erie. It could not be identified which ship the rudder belonged.